Zawinul fans on the other size of the Atlantic may be amused to learn that 75 has finally made its appearance in record stores here in the US. I don’t know what the rationale is for delaying the US release for so long. Perhaps it has to do with licensing issues, as the US release is through Heads Up International And I wonder when it became available in Japan. But it’s good to see it stocked in record stores here. 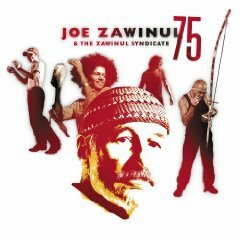 I assume most Zawinul fans either already own 75 or intend to purchase it. Aside from documenting Joe’s last live tour with Sabine Kabongo, Linley Marthe, Aziz Sahmaoui, Alegre Corréa, Jorge Bezerra, Jr. and Paco Sery, 75 is a must simply for the inclusion of Zawinul’s duet with Wayne Shorter, recorded during Joe’s next-to-last concert.